"Documentary about unexplained phenomena experienced by staff and passengers on the London Underground network. One billion people a year descend 150 feet below London, to the tunnels and stations of the tube, without a second thought for the thousands of graves, church crypts, and plague pits that the Tube has disrupted over its 100 years. Featuring previously unheard accounts from people who work on the network, drivers, station staff and workers." This should be fairly interesting as I've not really come across any new accounts of ghosts since I built the Tube ghosts page on goingunderground many moons ago. Watch out for those ghouls tonight! It appears that Orlando Bloom might be seen as a bit of a Line Lothario as he claims that he loves travelling on the Tube as it gives him an excuse to stare at beautiful women. 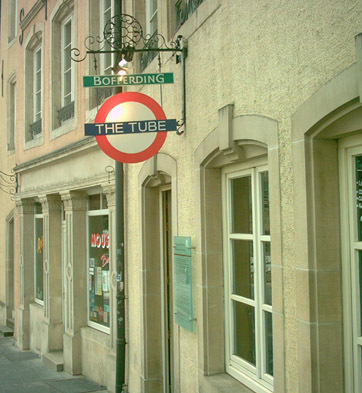 He told London Lite: "I've always been taken with the Tube. I used to fall in love on the Tube all the time. You sit there opposite someone, your eyes meet, nothing is said and then you both get up and go off into your own worlds. It's like this weird underground network and I've always found it fascinating." But it doesn't sound as though he's ever made a move as and from his track record of Hollywood beauties such as Kate Bosworth, Uma Thurman & Penelope Cruz, I personally don't think he'd be snuggling up to London commuters just yet. 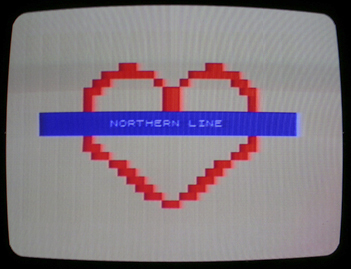 London Lite also reported that of all places, the Nothern Line seems to be the best place to find romance. Perhaps, it's because people spend so long waiting for trains there it might be the best line to strike up a conversation. Looks like top electro duet Schmoof got it right with their song Northern Line & Sarah from the band kindly let me reproduce the lyrics & the graphic above. Hopefully the Northen Line is going to be Schmoof's second single so we'll get to hear it soon. Have you found love or a least got a date from meeting someone on the Tube, or do you know anyone who has? One of my friends dated a guy for a while, as they travelled on the same mainline train, but I've never found the Tube to be much of a Love Train. Just got back from seeing The Devil Wears Prada and I imagine that Meryl Streep's fashion editor character would be giving a slight purse to her lips in disapproval if she travelled on the London Underground. Not only are the women more than a size 8 and look like they eat carbs, but I don't think their unique "look" would make the pages of her Vogue-a-like Runway magazine. She's clearly trying with the knock off designer bag, but it's a shame she felt the need to attach a pink furry err... blob and a pink ribbon too. But I shouldn't criticise too much as maybe it's a nod to Breast Cancer Awareness month. 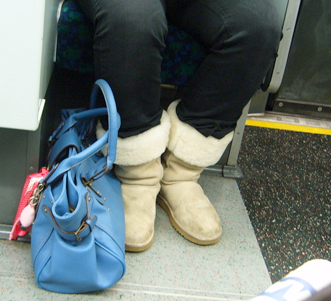 Pity we can't have an Ugg Awareness month, where we're allowed to point at people wearing Ugss and say "Are you aware of how ridiculous you look?". Really not sure what's going on with this guy's turn ups here. I looked around for a push bike, but nothing in sight. 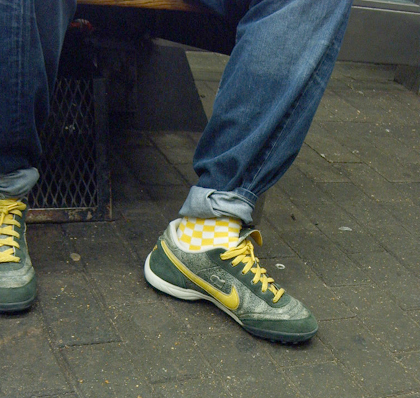 I wonder if he always wears yellow socks with his yellow & grey Nikes. One can only hope he's not a doctor as the socks are almost approaching "novelty socks" which have apparently been banned by the NHS. They don't call Hammersmith, Glamoursmith for nothing. Trendy little cap, check. Trendy fur trimmed jacket, check. Oversized T shirt dress, check. Micro denim mini skirt with heavy tights, check. But as you look down it all starts to go a bit Pete Tong. Why do you have a scarf tied around your boot? Is it that your boot is feeling a bit chilly? Or perhaps it was to hide a hole? 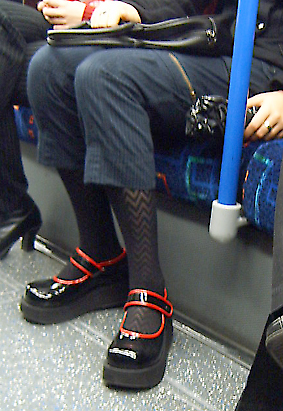 Twiggy trousers, zig zag tights and Minnie Mouse shiny patent black and red shoes. As Shazza Osbourne would say - Fabulous! Anti-Flu Spray on the London Underground? Yet, another cold and flu story, a couple of weeks ago the London Paper got us into thinking that coughing could be "banned" on the Tube and now it seems that carriages could be sprayed with disinfectant to protect us underground. Hong Kong is among the first cities to test one of the latest anti-flu products, nano silver-titianium dioxide coating, or the more snappy acronym NSTDC. Apparently it is applied to all surfaces inside a subway car that passengers commonly touch. 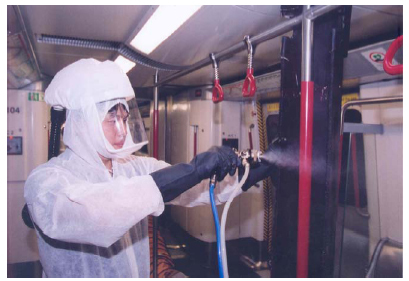 The preliminary tests conducted in Hong Kong show that the disinfectant reduces the amount of bacteria by 60 percent and it looks like the London Underground might be heading the same way. 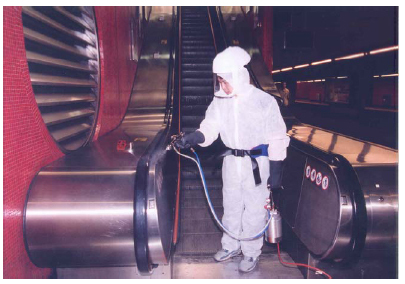 "In Hong Kong, NSTDC is spread everywhere, including escalator handrails, ticket machines and poles. This product is long lasting, according to the MTR spokesman. It is only spread once every three years and checked once every eight months." The guys and gals at TfL have shown some interest in this and are monitoring the results. "If it is proved to be effective, then we would consider using it," said Stuart Ross, spokesman for Transport for London. However, if you think you'll be seeing blokes in white suits with sprays in the next couple of months you'll be wrong, as Ross continued "But we will not use it this winter". Metro reports that TfL have plans for dealing with flu working with the Government and other agencies, but there's no mention as to what those plans are. Perhaps they weren't prepared to cough up the 1.5 million dollars that the spraying system is costing the MTR and feel that a "Wash your hands after using the Tube" sign might be much cheaper. Would you share your music on the Tube? Many thanks to both Geoff and Matt from the New Scientist who both sent me a link to Undersound, a project by three design students in California and London where you can upload and download songs at different points around the Tube network and even hear tunes that other commuters are listening to, all via Bluetooth. While in the carriages of the tube, I can browse undersound music of other people in range. Because the system will be gathering metadata on the stations where the track has been (via uploading/downloading at the transfer points) and thus its spread within the network, the time it has been in the system, the number of times it has been played, the number of people who have played it, and so on, I will be able to see this information when I look at other people's music. I can browse through other's tracks anonymously, but if I decide to download a song from someone else an alert will be triggered on their phone letting them know that I am grabbing one of their tracks." They compare this type of music sharing with the way people "share" their copies of Metro (obviously written before London Lite and the London Paper came on board). But do I really want to listen to what other people are listening to on the Tube? 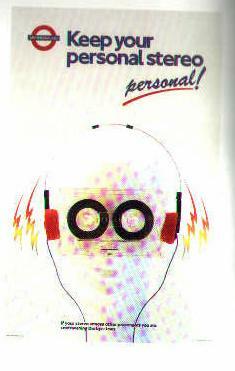 Haven't the London Underground spent years trying to get us all to turn the volume on our headphones down, implying that personal stereos should be kept ..... er.... personal? As I browsed the website looking for more of "the science bit", I learnt that apparently each station would have a visual display of the music on offer. Does this imply that the music stays at the station even when you leave it? Would you be able to travel through certain stations as you knew a lot of drum & bass would be on offer? Whether the three women will get any funding to take the project further remains to be seen. At the moment it sounds too much like a scientific experiment and I'm not sure anyone would buy into it with the current language "It combines situated and ubiquitous technologies in a way that reflects current social practices as songs are highly linked to the location where they become accessible but their journey throughout the space depends on people's movements and behaviour over time." But stranger things have happened and maybe there is a mass market for sharing music on the Tube. What do you think? 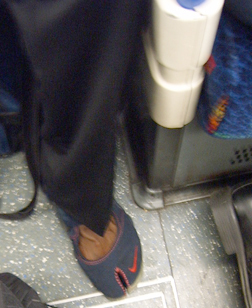 Back to the weekly Tube fashion Victims. 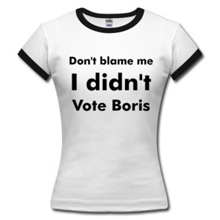 There's a retro theme to the couple of victims this week, with a definite nod to the sixties. I like the way she kindly sat underneath a fashion poster too and then fell asleep so I could be more overt than usual with my snap. He said "After reading your blog for a couple of months, I finally had to act. 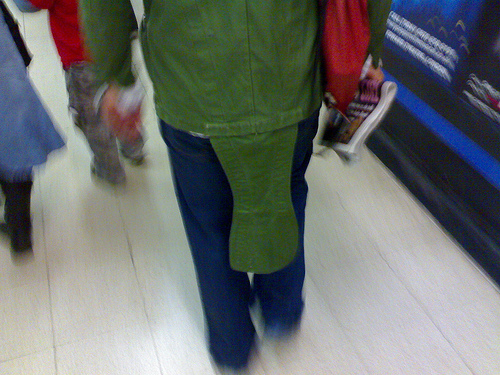 I saw this guy wearing this interesting coat (at Kings Cross) getting off the Northern line the other day, and I had to pass the photo on to you!" It's like a short version of those parkas with the long fishtails that made a comeback in the eighties with the mod revival. But the tail on this one looks more like the bill on a duck billed platypus. Cheers John. I know from experience that it's very difficult taking pictures of victims on the move like that and he did a great job not to get it too blurry. Are we Neanderthal on the Underground? Yesterday the Paris Metro launched a drive for better manners on their subway with an interactive website and poster campaign designed to make Parisian commuters think about their behaviour. The poster theme describes L'Homo Modernus and tries to portray us as people who have evolved beyond throwing our half eaten food ont he floor, not smoking in places we shouldn't and putting tools like Stanley knives to good use rather than slashing seats. RATP says it spends 25 million euros a year cleaning graffiti from trains and buses and has to repair 4,500 seats slashed with knives at 100 euros each every year. It could also buy 30 new subway trains with the revenue it loses to fare dodgers each year. Their site outlines the usual list of annoying behaviour that we suffer on the Tube (people screaming down mobile phones, putting their feet on the seats etc etc) with seated passengers deliberately ignoring pregnant women topping the list. 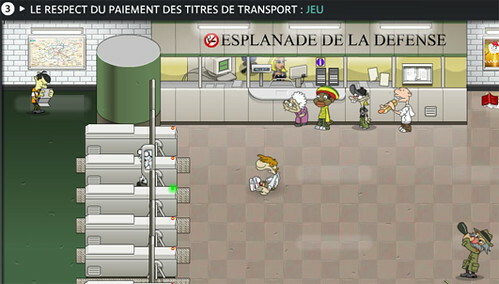 You can even play a little interactive game where you can move characters around a station concourse. I'm rubbish at computer games and also only have fairly rudimentary French, so all I managed to do was get a chavvy looking hoody to keep crashing into the barriers and bouncing back into the station. But perhaps that's the intention and it's a new type of therapy where you can exact your revenge on fare dodgers. Anyway it's sobering to see that the Parisians have the same problems as us and after yesterday's discussions on smoking, perhaps it may mean that French Smoking Man might think twice before lighting up. As I was coming home last night a woman on my Westbound platform, decided to take on her own personal campaign against someone heading Eastbound who was smoking a fag. Instead of just tutting, or even reporting him to one of the handy station staff, she shouted across the platform "There's no smoking on the London Underground, there hasn't been for years". Smoking man either pretended that he couldn't hear her or decided that he couldn't speak English. "I said there's no smoking on the London Underground. Put that cigarette out", she said with even more force. Smoking man walked so that he was standing opposite here and shrugged his shoulders. Good gambit, I thought, perhaps he really can't speak English. "Don't you understand English? Can't you see the signs everywhere?" she said sounding increasingly hacked off and like a blonde, female, shorter version of Basil Fawlty. "PUT YOUR CIGARETTE OUT"
At this point Smoking man remembered that he could speak English, but with a vaguely French accent said "What business is it of yours?". "Put it out or I'll report you. NOW". He put it out, but then started mocking her, repeating back "Put it out or I'll report you". It was like being in a school playground. She retorted back with a 'talk to the hand' type of sign, and then mimed "Yack, yack, yack" with her hand and walked away in disgust. 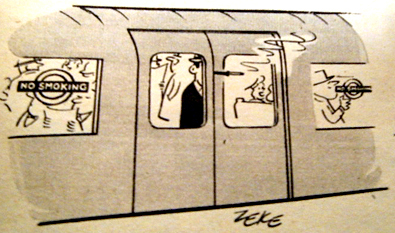 I do actually remember when you could smoke on the London Underground (pre the King's Cross fire in 1987) and there were smoking carriages - the middle carriage - which were pretty hideous. In July 1984, London Transport began the ban on smoking, but it was intially only a trial for a year and hundreds of people ignored it. We obviously needed more people like the public spirited Ms Fawlty above to "enforce" the ban. However, I wonder why was it deemed OK to smoke in the middle carriage? And is it really banned more as a fire risk than a health risk? Researchers apparently have "discovered" that air quality in carriages and at stations is up to 73 times worse than at street level and a 20-minute journey on the Northern line through central London has the same effect as smoking a cigarette. Perhaps Ms Fawlty ought have told Smoking Man to spend a while on the Misery liine so that he could have got his fix there instead. Back to Friday's Fashion Victims. The day where I showcase people who could be deemed as fashion victims or have a style that they have "made their own". (Trade mark Louis Walsh). There may be a few more parents perusing this week's section, but more on that later. Are these this year's Uggs but for men? Are these called Rhino Toes? Or have I just made that up? Oversized Nicole Richie / Victoria Beckham shades, tick. Top Shop / Superdrug cheap looking canvas bag as modelled by Kate Moss, tick. Micro shorts in October, tick. 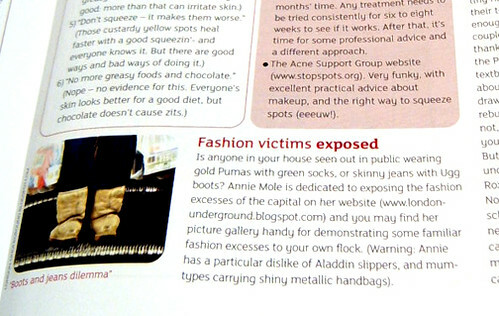 Finally, I'm pleased to say that the Fashion Victims have been deemed as vaguely educational as this month they are featured in a family lifestyle magazine "With Kids"
The feature in the Planet Teen section says "Is anyone in your house seen out in public wearing gold Pumas with green socks, or skinny jeans with Ugg boots? Annie Mole is dedicated to exposing the fashion excesses of the capital on her website and you may find her picture gallery handy for demonstrating some familiar fashion excesses to your own flock. (Warning: Annie has a particular dislike of Aladdin slippers, and mum-types carrying shiny metallic handbags)." I love the idea of parents sitting down with their kids and instead of saying - "Don't go out in that as you'll look like a tart", but "Don't go out in that or you'll end up on Annie's fashion victim blog". A disturbing responsibility, but I'm pleased the writer is aware that Mums have no escape either. That's it for this week. The previous victims can be found here and if you've missed the whole picture gallery they can be seen on the following Flickr set. Dontcha wish your boyfriend was a girlfriend like me? I was highly impressed with the interest this man was showing in his girlfriend's collection of Elizabeth Arden cosmetics. In my experience you have to drag a man almost kicking and screaming into a perfume or cosmetics department. They certainly don't spend the time it takes to travel from Leicester Square to Glamoursmith unwrapping each item of make up and discussing how you put it on. He even tested some of the make-up on the back of his hand. The poor girl looks like she wants a turn with the make-up unless she was thinking about putting up some shelves or changing the brake fluid in the car when they got back home. Perhaps she'll hire him out as "rent-a-boyfriend". If so can I have him this Saturday afternoon. I think that was the intention with this very err.... charitable railway sign which I snapped on the outside of a church. Admittedly it was a church with railway associations. Any guesses which one? 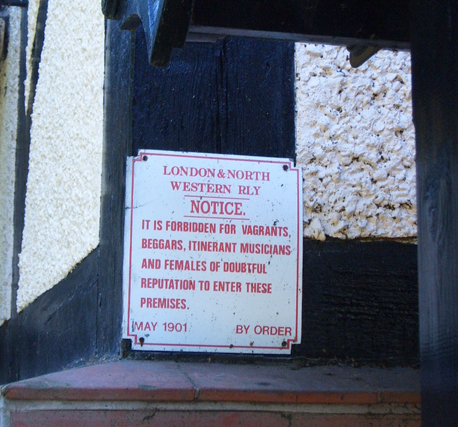 I'd love to see how sign writers of 1901 would deal people outstaying their welcome or various "undesireables" on the Tube today. People wonder why I change on the Sadistic Line at Hammersmith station rather than at Baron's Court. But there's never a dull moment in the waiting room there, as it usually doubles up as either McDonalds or EasyHotel. Last night's sleeper would have actually had more space in the waiting room at Hammersmith Station than he would have in an EasyHotel commuter pod. Take the following description of Stelios's orange rooms "found in the centre of international cities, targeting short-stay customers". Not much difference between that and a Tube waiting room really. Sheriff Ken - you're missing some valuable revenue here. 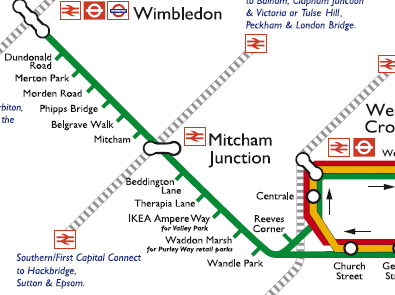 The Tube's lawyers got all in a kerfuffle about the "Sponsored Tube Map" with companies replacing station names, but it looks like the flatpack Kings IKEA have managed to get onto a TfL map. The webmaster of Croydon Tramlink's unofficial site said "The latest Tramlink route maps show Ampere Way as IKEA Ampere Way. It now seems likely that the stop will be formally renamed IKEA Ampere Way, probably with some kind of IKEA branding. This issue seemed to arise again from when it was originally rejected by TfL when the system was built as no stop should be named after a commercial enterprise. However, with Centrale being named as such, IKEA appeared to approach TCL/TfL again. Nothing official has yet been announced. 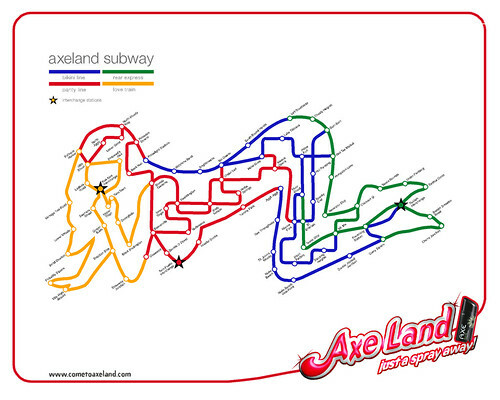 However, with it on the route map, it is useful for passengers. Enquiries as to which tram goes to IKEA and which stop to use must be in the top 10 most frequently asked questions that I get asked both online, and while travelling on Tramlink." Does this mean that Neasden might be renamed "IKEAden" or that we'll see "Ikea Hale" appearing on the Victoria Line? Ahhh, what jolly japes some people get up to. Mike played a trick on one of his mates "He'd fallen asleep, and I used the government-recommended bottle of water to give the impression he'd wet himself. He wasn't impressed, but everyone else thought it was funny." I've cropped the picture to try to spare Mike's mate as much embarrassment as possible but I do like the look of the woman reading the Haruki Murakami book next to him. I'm possibly the world's worst culprit for falling asleep on the Tube, but luckily I live near the end of the end so if I ever miss my stop, it's fairly easy to get back home. There are a number of urban myths knocking around about people falling asleep. and people's reaction. 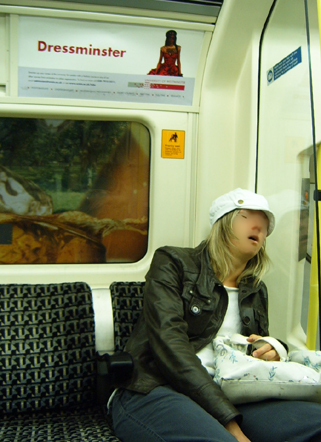 My favourits is an old lady who fell asleep on the Metropolitan Line and was sleepily woken up by the driver. "Is this Aldgate East?" she asked. "Nah love", the driver replied "It's All get out". Have you ever had to wake anyone at the end of a line? How did they take it? Off to send TfL's lawyers in another frenzied tour of tracking down (more than likely" unauthorised uses of the London Underground roundel. However, the weirdest came from Ellen F who spotted this advert on the Hauptbahnhof U-Bahn (central station underground station) in Hamburg. 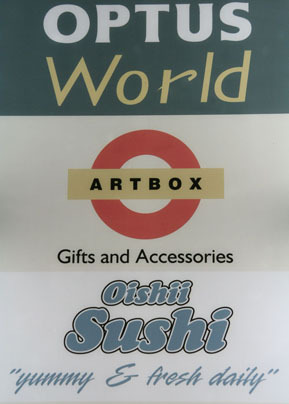 If you want to see the station names click on the image to err, enlarge. I can just about make out some saucy Carry On names such as Mile High Airport, Threeway Junction, Lower Grind, Seemore Street, Spanky End and Moor Wood. They must have had a lot of fun in the creative department of that agency. Keep those sightings coming in and I'll add to the collection. What's the smelliest station on the London Underground? "Created from reports sent in by Gawker readers, the map displays particular smells -- horrific and sublime -- encountered throughout New York's subway stations. Mouse over any station to see the station name, subway lines, and types of smells to be found there. Click on any station for a popup with actual reader smell reports." The key is particularly expressive and American spelling aside, covers a lot of the smells you'll find on the Tube. Everytime I go onto the East London Line I think it smells like a toilet. I check the seats and it's not because some undesireable has been using it for that very purpose. Maybe it's something to do with the age of the line or the remnants of the Thames Tunnel, but I can't wait to get off it. 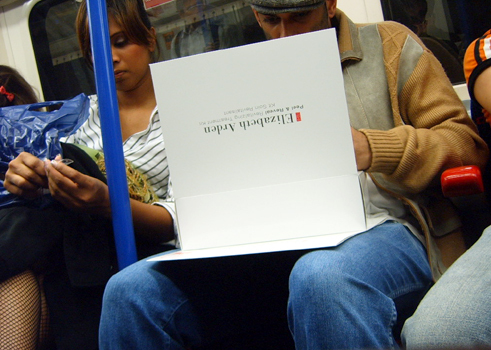 It's interesting that the New York Subway has "perfume" as one of the smells as you may know that the Tube trialled exposing commuters to a perfume called "Madeleine" at St James's Park, Euston and Piccadilly Circus stations (presumably they needed it). The fragrance was "a fresh, watery floral bouquet of rose and jasmine combined with citrus top notes. Tiny touches of fruit and herbs give way to strong woody accents and a hint of sweetness in the base." and was said to counteract the "interesting collection of odours in stations, reflecting all aspects of London life, some nice, some not so nice." It was withdrawn after a day as it made passengers feel sick. So perhaps we prefer the smells of London life, old sweaty socks and all. Do you have any contenders for smelly stations? And if so, what do they smell like?